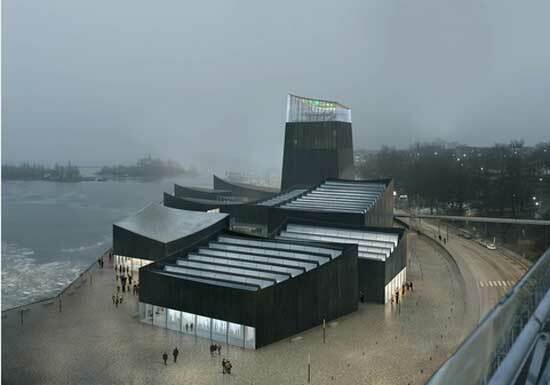 “Art in the City,” the winning design for the proposed (but not yet government-approved) Guggenheim Helsinki, is “a collection of [nine] linked pavilions, each orientated to respect the city grid, and anchored by a lookout tower,” in the words of the jury statement on the selection of Paris firm Moreau Kusunoki Architectes, founded less than four years ago by the husband-and-wife team of Nicolas Moreau (previously and briefly with SANAA) and Hiroko Kusunoki (previously with Shigeru Ban). The most distinctive feature of the sprawling “Art in the City” (cue Sarah Jessica Parker?) 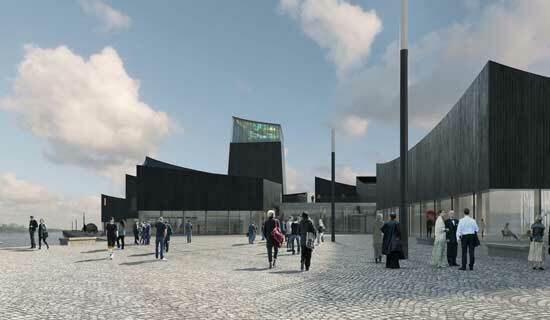 is dubbed “The Lighthouse.” The skin of the pavilions is composed of glass and dark charred wood. It was recognized that further work would be needed to resolve vertical circulation, use of the main terrace, and the construction of the roof, but these issues were considered to be a normal part of design development, and the Jury had confidence in the strength of the design concept. The concept is extremely flexible and is designed to embrace evolving urban, museum, and technological requirements. But will this ever get built? 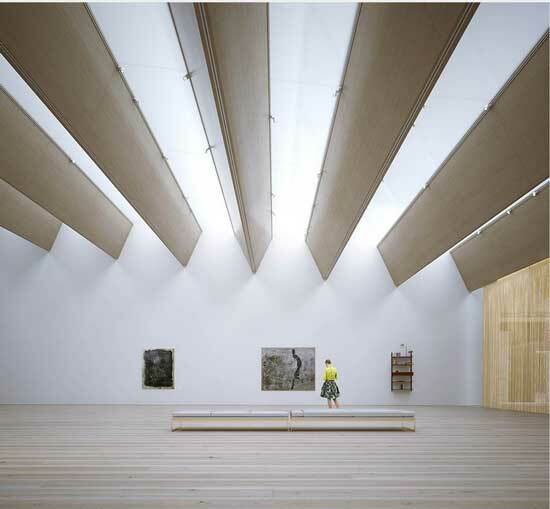 As noted in the Guggenheim’s press release: “Further consideration regarding the development of the proposed museum lies with the Finnish stakeholders at the local and national level.” Funding is expected to come from the city and/or the Finnish State. The questions that I raised about this project back in October 2013, when the Guggenheim released its revised proposal, are still very pertinent today. Mr. Pajamaki [said] that it appeared that the winning design would dominate the harbor despite pledges to fit it into the environment of Helsinki’s neo-classical architecture facing the area. The financial aspects are also at issue. When the competition was launched, the construction cost was pegged at €130 million, excluding taxes. Funding for the project is expected to come from both public and private sources. The best that Mayor Jussi Pajunen would say for the press release is: “A Guggenheim Helsinki could have a significant, positive effect on Helsinki and Finland”—not an unequivocal endorsement.